We are offering all five issues and the five CDs that go with them as specially boxed sets to save you money. 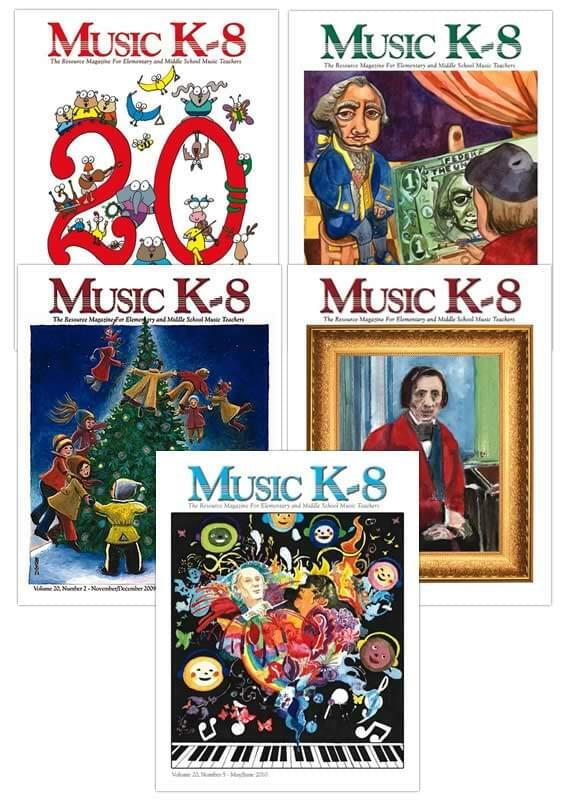 Music K-8 magazine has introduced a number of new concepts to the area of elementary music publishing. Probably the most popular one has been the fact that a subscriber has the right to legally reproduce the music in each magazine for every student she or he teaches, no matter how many schools or students are involved. In the magazine, we provide a Piano/Vocal Part and illustrated Lyric Page for most of the songs. Student Reproducible Parts, which are available separately for this entire volume or with the magazines and CDs, contain every recorded tune with the singers' parts extracted for fast, less expensive photocopying. They are available in print or downloadable format. To hear sound clips from and read details about any song in any issue, visit the Past Issues area. Important Note: CDs and PartsCDs and Student Reproducible Parts for Music K-8 will only be sold to customers who own the corresponding magazines, as it is the ownership of these magazines that conveys the use and performance rights for the music and materials found in them. Access downloads through your account after order is processed. Account will be created if you don't have one: watch for e-mail.